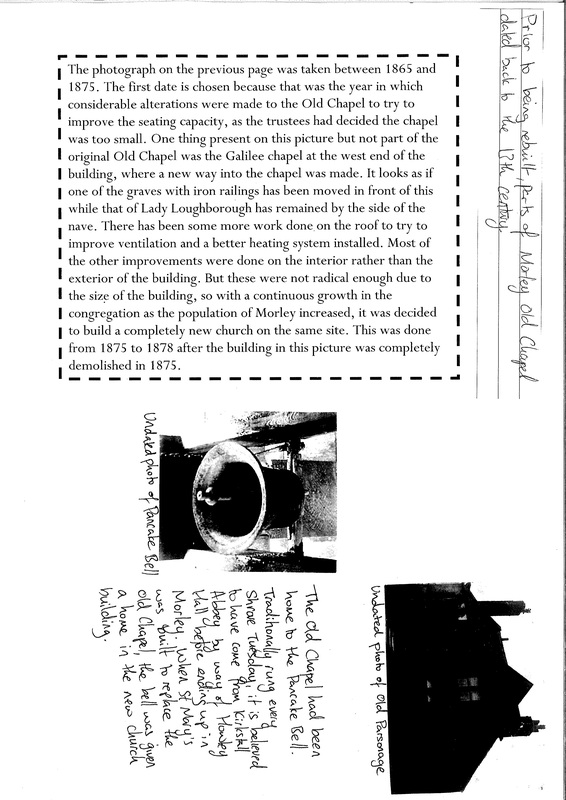 To mark the refurbishment of Morley Library as Morley Community Hub, Assistant Community Librarian, Helen Thomson, presents a brief history of the Saint Mary’s-in-the-Wood Church of Morley. 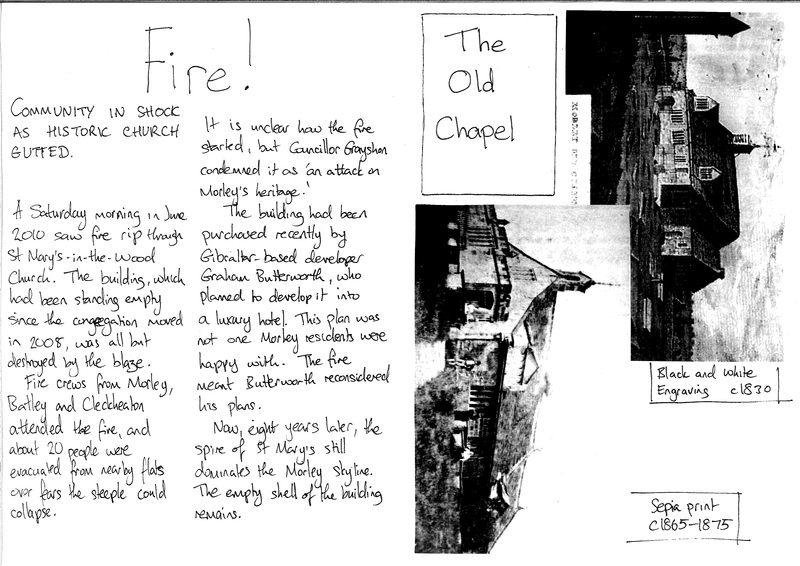 This article is based on a local history zine that Helen has previously created – that zine is reproduced below, along with some photographs of the Church, as taken by Helen in 2018. Morley Community Hub will reopen on January 28 and there will be tea and coffee available all day. 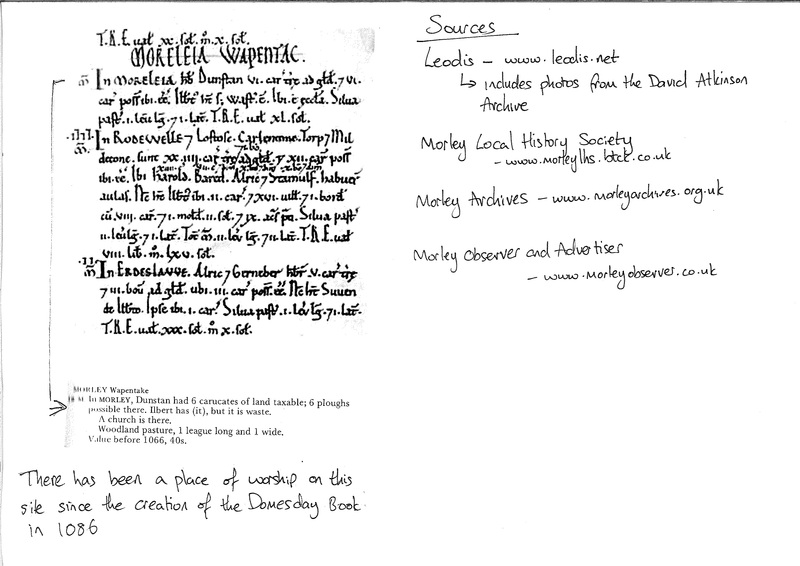 When the entry for Morley was made in the Domesday Book in 1086, there was already a church on the site where Troy Road meets Commercial Road. 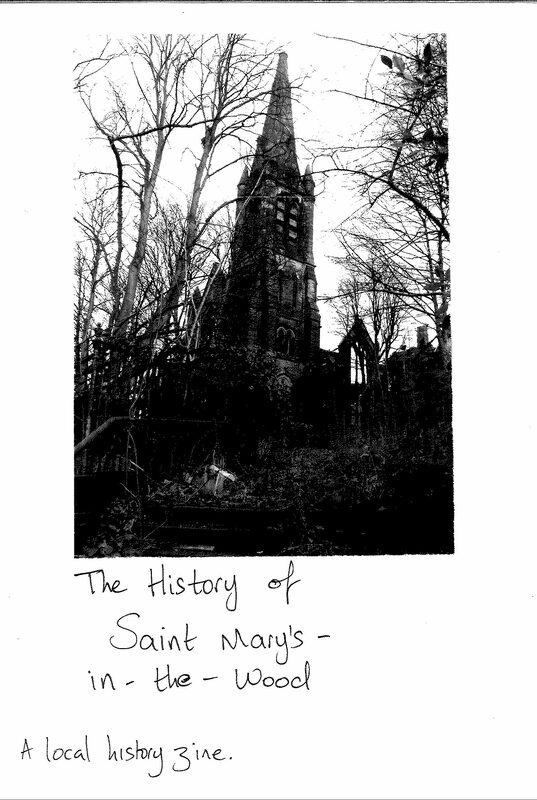 No doubt a much less grand affair than St Mary’s-in-the-Wood, it would have been the centre of the community it served. There are fairly extensive records of what became known as the Old Chapel on this site. The engraving shows the chapel as it was in the 1830s – at this time the oldest parts of the building dated back to the thirteenth century – prior to the building work in the 1860s. This work saw the nave enlarged, the interior modernised, the lighting and heating improved and a porch added on the west end. 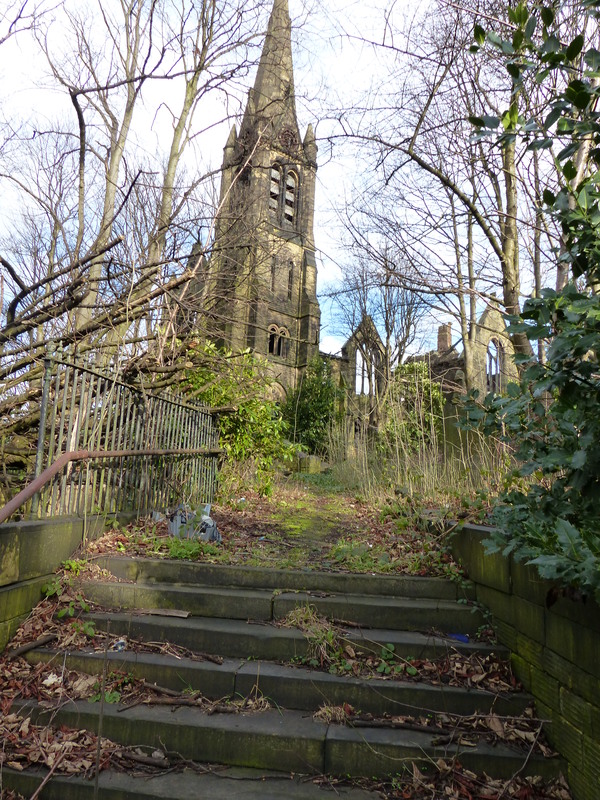 The alterations aimed in part to improve seating capacity, but they weren’t radical enough to cope with the growing congregation, so in 1875 the Old Chapel was demolished and work began on a new church on the same site. St Mary’s-in-the-Wood opened its doors in 1878. The architects for the new, much grander church were Lockwood and Mawson, and the building cost £7000. Although the old building was gone, some of the more valuable artefacts were kept to go into the new church. The first of these was the Pancake Bell. 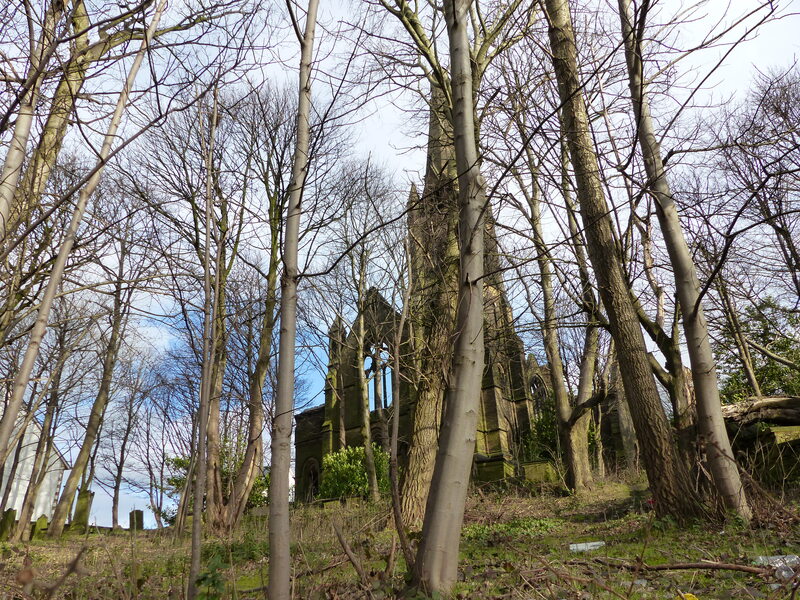 Thought to have come from Kirkstall Abbey, by way of Howsley Hall, the Pancake Bell was historically rung on Shrove Tuesday – a tradition that continued into the twenty-first century. The second was the Coat of Arms of Charles II, which although saved from destruction, was not displayed in St Mary’s until around 1930. And lastly, the clock from the chapel was saved, perhaps to make sure sermons ran to time. About 100 years prior to the building of St Mary’s, there had been upheaval of a different sort within the congregation. Doctrinal differences led to part of the congregation of the Old Chapel splitting away to form the New Old Chapel. The group initially hired a room in the house of Joseph Webster on Banks Hill, but in 1765 they opened their own church, built on land leased from the Earl of Dartmouth. The road it was built on became known as Chapel Hill. 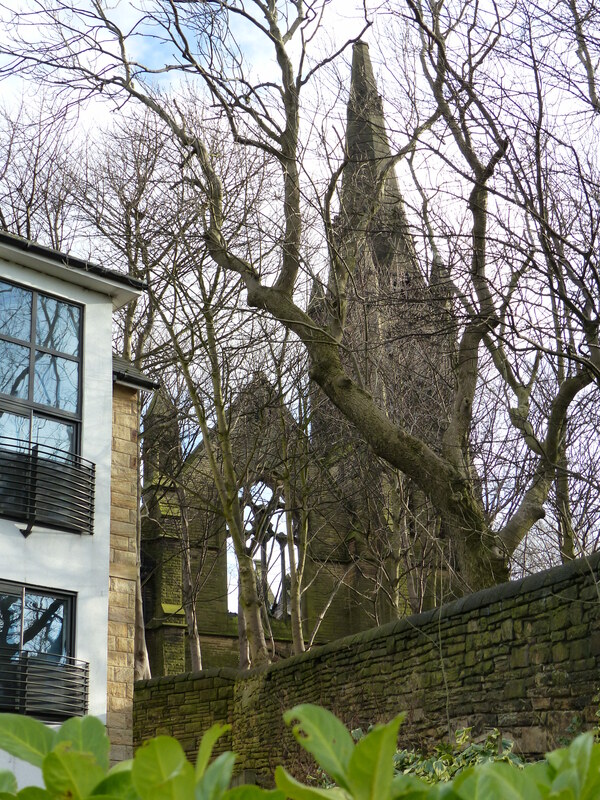 Further upheaval was to come in the 1830s, with the building of St Peter’s Church on Rooms Lane. Having had very little representation in Morley for hundreds of years, the Anglican Church was making its presence known. And the Earl of Dartmouth, as a member of the aristocracy, was himself a supporter of the Anglican Church. In 1830, he raised the rent on the chapel from 1 shilling to £50 a year. 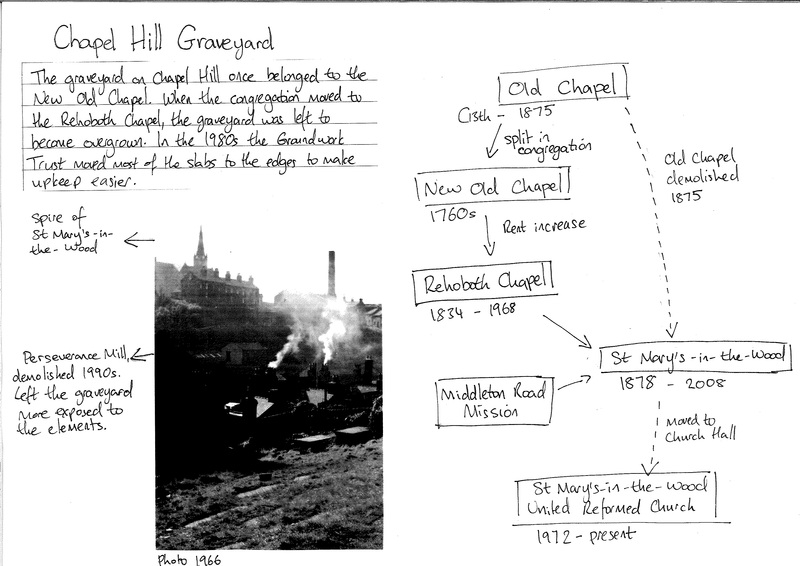 So the congregation of the New Old Chapel acquired land on Dawson Hill and the Rehoboth Chapel was born. By 1870, they had the largest Sunday School in Morley, as well as ministers who supported the creation of Board Schools in the town. Sadly, the mid-20th century saw a decline in church attendance. 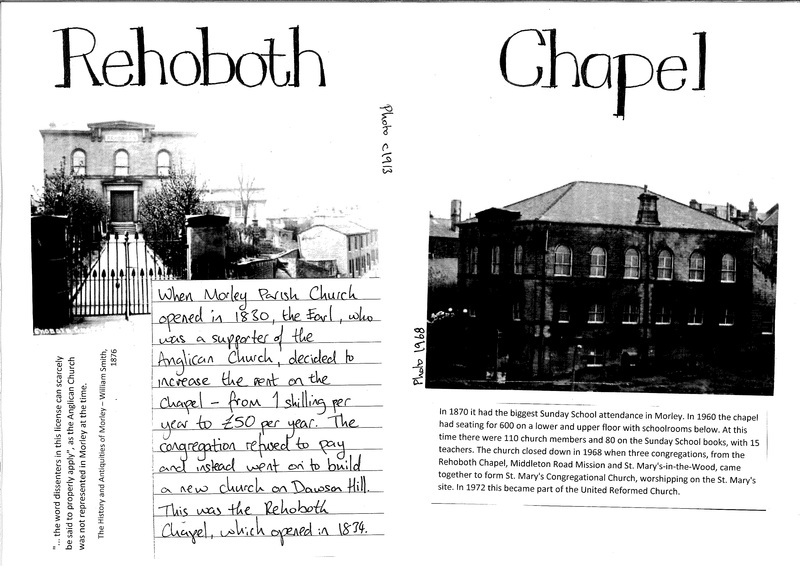 In the 1960s, Rehoboth Chapel had only 110 members in its congregation; not a lot for a building that could seat 600 people. So in 1968 it closed its doors, and the congregation moved to St Mary’s-in-the-Wood, on the very same site they had left two centuries before. The story, however, does not end there. In 1875, when the Old Chapel was demolished, so was the Old Parsonage. This building had sat on a strip of land known as the Langcroft, which had been leased to the church by the Earl of Sussex in 1650 for a period of 500 years. 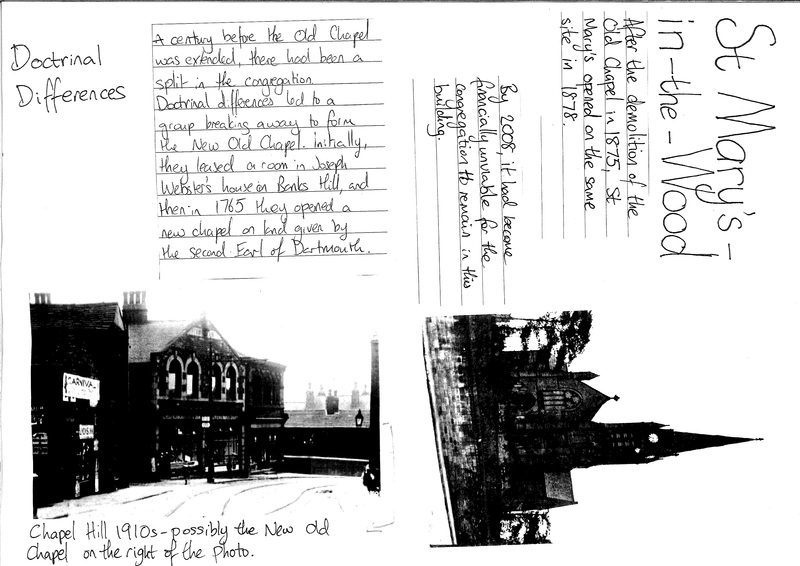 Sometime between 1898 and 1900, the St Mary’s-in-the-Wood Sunday School was erected on the site. Now a grade two listed building, it was used during the 1960s and 1970s by both the congregation of St Mary’s and the Wakefield Tutorial School. By 2008, it had become financially unviable for the congregation of St Mary’s-in-the-Wood to continue to worship in the grand church on Troy Road, so the decision was made to move into the Sunday School building. Developer Graham Butterworth purchased the land and planned to develop it into a luxury hotel, causing considerable upset in the local community. 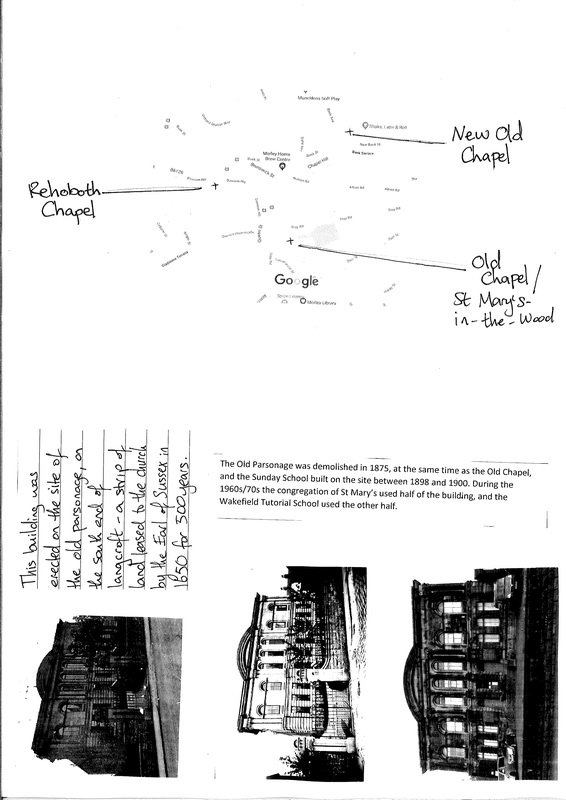 However, these plans were never realised, as in June 2010 fire ripped through the church. Several fire crews attended, and residents of nearby flats were evacuated. 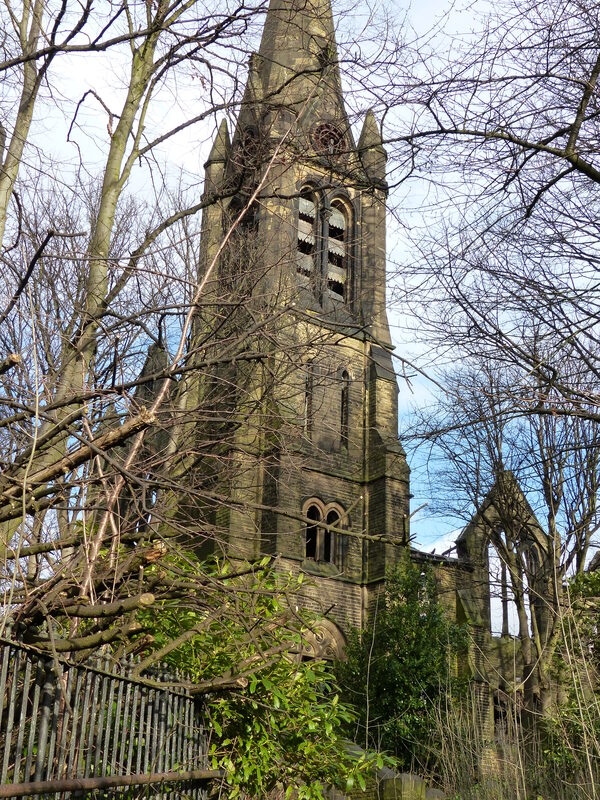 What remains of the building is a skeleton, and despite fears over its structural stability, the empty spire still towers over Morley. Neither the New Old Chapel nor the Rehoboth Chapel are standing any longer, but the cemeteries remain, on Chapel Hill and Dawson Hill respectively. You can read more about the work Leeds Libraries do with zines through two articles on our sister-site Leeds Reads. 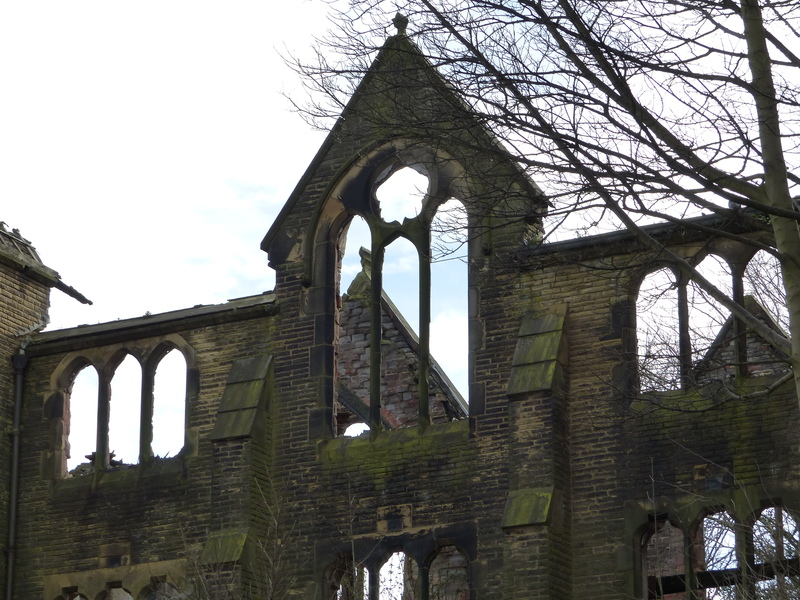 What a fascinating article about some churches in Morley. A thoroughly good, informative and enjoyable read. Thank you for your kind comment and we’re pleased you enjoyed the article! We’ll pass this onto the article author.